Would you make a good back-end developer? Take our career test to find out how you match with this and over 800 other careers. What is a Back-End Developer? What is the workplace of a Back-End Developer like? What’s the difference between a front-end and back-end developer? What languages do back-end developers need to know? The back end of a website is a combination of technology and programming that powers a website, the behind-the-scenes functionality or brain of a site. This back end of a website consists of three parts that a user never sees: a server, an application, and a database. A back-end developer is someone who builds and maintains the technology needed to power the components which enable the user-facing side of the website to exist. Their back end code adds utility to everything the front-end developer creates. These developers are responsible for creating, maintaining, testing, and debugging the entire back end. This includes the core application logic, databases, data and application integration, API and other back end processes. The back end runs a website—the user doesn’t see it or interact with it, but it is always running in the background, delivering functionality and a desktop-like experience. 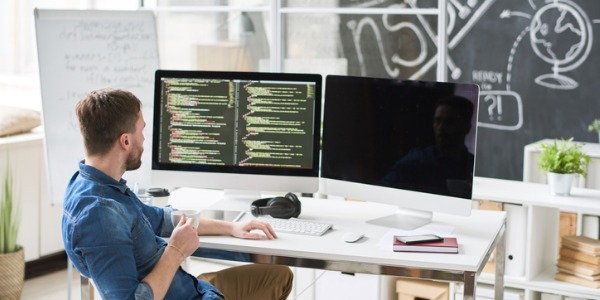 Back-end developers play a critical role in web development teams, and make sure that data or services requested by the front end system or software are delivered. The back end is the combination of a database and software written in a server-side language, which is run on web servers, cloud-based servers, or a hybrid of both. 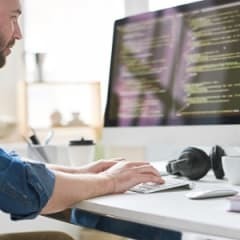 In order to make the server, application, and database communicate with each other, back-end developers use languages like PHP, Ruby, Python, Java, and .Net to build an application, and tools like MySQL, Oracle, and SQL Server to find, save, or change data and serve it to the user in front end code. After communicating with a business owner and understanding what their needs and technical requirements are, back-end developers use the aforementioned tools to create web applications with clean, well-documented code. They come up with the most effective and efficient solutions for engineering technology by converting and returning data into front end code a user can interact with, such as: filling out a form, creating a profile, shopping online, etc. Are you suited to be a back-end developer? Back-End developers have distinct personalities. They tend to be investigative individuals, which means they’re intellectual, introspective, and inquisitive. They are curious, methodical, rational, analytical, and logical. Some of them are also conventional, meaning they’re conscientious and conservative. Does this sound like you? Take our free career test to find out if becoming a back-end developer is right for you. The life of a developer typically involves working long hours. Back-end developers can be found almost anywhere, working as full-time permanent employees in both large corporations and small or medium-sized companies. They can also work as freelancers or independent consultants, or as contractors for an employment agency.